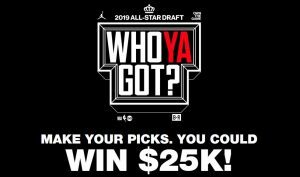 Grand Prize (1): The grand prize is a check for $25,000 and a jersey (size and type of jersey determined by Sponsor in its sole discretion) (“Grand Prize”). The approximate retail value (“ARV”) of the Grand Prize is $25,300. First Prize (1): The first prize is a VIP package to an All-Star weekend (“First Prize”). Trip includes round-trip coach class air transportation from a major commercial airport near winner’s residence to Charlotte, North Carolina for winner and one (1) adult guest (age eighteen  or older), two (2) nights hotel standard accommodations (single room/double occupancy), transportation to and from hotel and arena, two (2) State Farm All-Star Saturday Night tickets on February 16, 2019, and two (2) tickets to the 68th NBA All-Star Game on February 17, 2019. Winner’s guests must be eighteen (18) years of age or older. If the winner elects to travel or partake in the Prize without a guest, no additional compensation will be awarded to the winner.The ARV of the First Prize is$7,358. Second Prizes (200): The second prize is a pair of Jordan sneakers (style, make and size of sneakers determined by Sponsor in its sole discretion) (each a “Second Prize”). The ARV of each Second Prize is between $120 – $200 (ARV varies based on men’s and women’s shoes as well as shoe size). Third Prizes (200): The third prize is a $25 NBA gift code (each a “Third Prize”). The ARV of each Third Prize is $25. Total ARV of All Prizes: The total ARV of all Prizes is $77,658.